I'm a big big fan of educational "toys." Building blocks, puzzles, manipulatives are my "eye candy." Ha! Seriously, I would just load them all up in my cart and take them all home with me if I could! I'll find somewhere to stash the new "toy" in my craft/ school closet ... or the "toy" cabinet upstairs in the kitchen! I like having puzzles, toys, games easily accessible, ya know... : ) And when my kiddos are having fun putting their little hands and minds to work without really realizing it is also working on a math or literacy concept... it's a win-win! Thus it shouldn't be any surprise that I gladly accepted to work with Geometiles-- a super neat product that "makes exploring math accessible to everyone." In exchange for an unbiased product review, we received a full 96-piece Geometile kit and access to their resource library which includes lesson plans and activities. 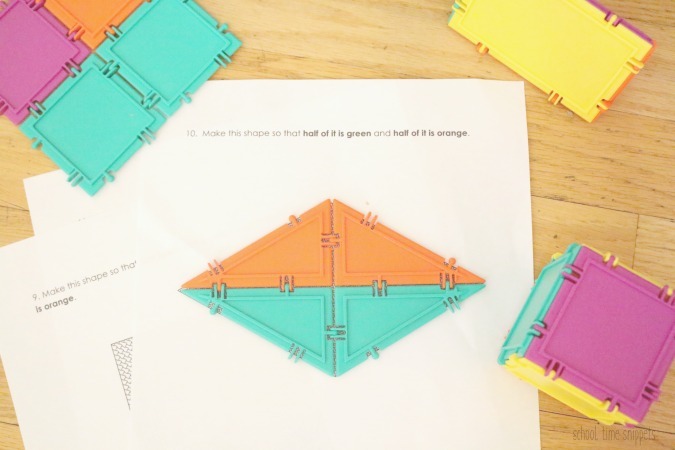 Geometiles is a versatile set of interlocking-tiles-- so think of Magna-Tiles (which we love, love, love) but designed to support math exploration. 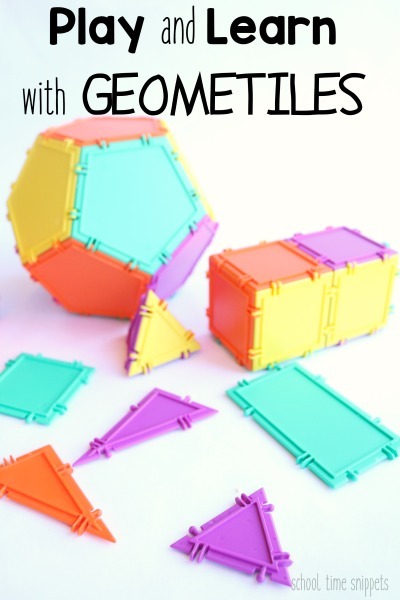 Great for geometry, fractions, etc! So fun to use for hands-on learners!! 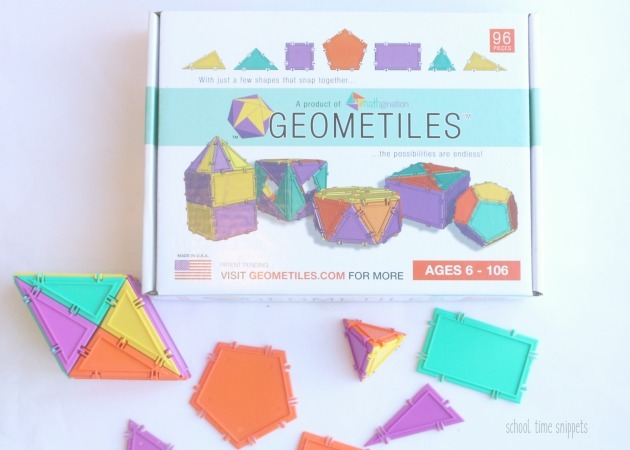 Geometiles was created to be used with first graders to adults, thus I believe that is why the box says for "ages 6-106," however, my 4 year old has loved creating all kids of shapes with them. 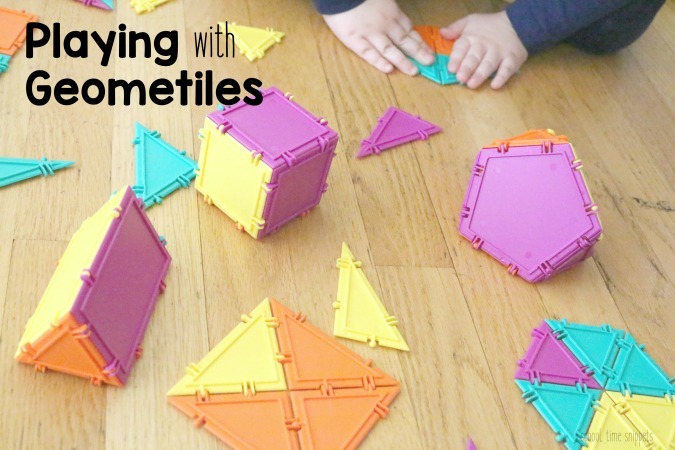 A great way to introduce math concepts to little ones... and the interlocking tiles also work on fine motor skills! So while my 4 year old had a fun time exploring the tiles through PLAY, I had my two older kiddos explore the tiles to LEARN. While browsing through the various activities and lesson plans in their Resource Center, I came upon some worksheets working on fractions. I think for most, math needs to be a pretty hands-on experience using games and manipulatives to see a concept in action; and I think that definitely goes for fractions. 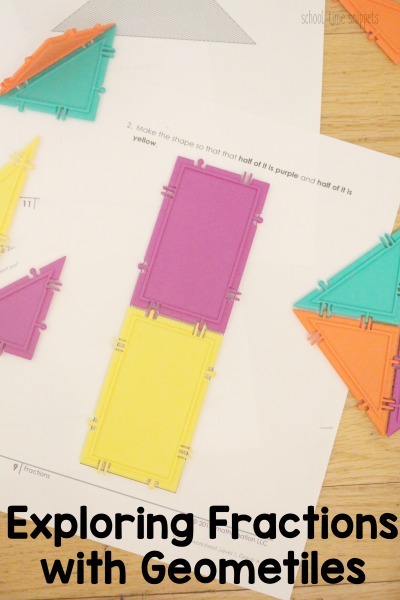 Fraction Snowflakes- fun STEAM activity! And using Geometiles was another great way to reinforce the concept! I printed off several of their fractions worksheets, and thankfully answers were also provided within the worksheets, because we got stuck on a few! They were quite the "brain teasers!" 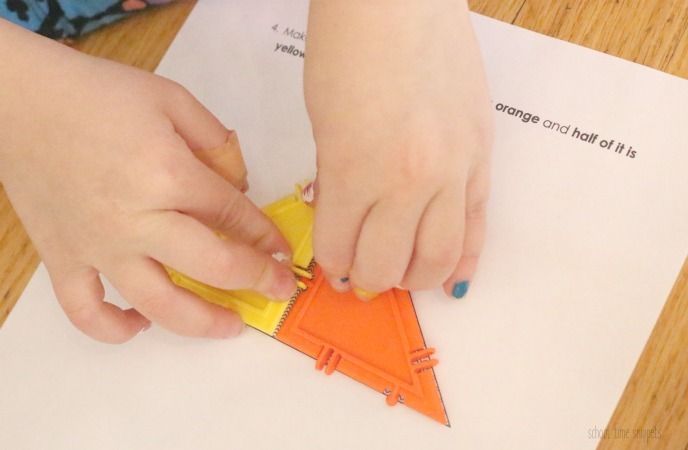 The worksheets provided a variety of tasks such as fill in the shape with tiles so that half of it is yellow and half of it is orange. We used several of the colorful tiles to build 2 dimensional shapes and learn about fractions! 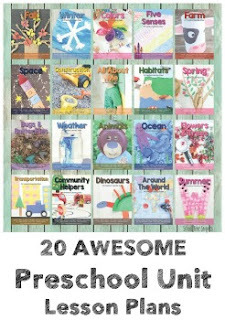 Such a great way to learn and play together! You can purchase sets of Geometiles from their Shop; they sell several Mini Sets of 32 pieces, a Full Set of 96 pieces, and a Jumbo Set of 512 pieces. My kiddos have loved learning, building, and exploring with these unique math inspired blocks, check out Geometiles website for more info! 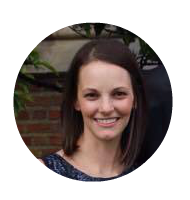 Or check out these links to learn more!